Crystal Bowls are ideal for use in the home or office to clear negative energy and bring in positive chi, as crystals are widely used in Feng Shui cures. There are seven musical notes that correspond to the seven colors of the rainbow and these are related to the seven main chakras, which in turn correspond to different areas of the endocrine system. They are available in 8" to 24" and are approximately $200.00 - $500.00 We have different notes and sizes at various times. Call for availability. The pure tones of crystal bowls carry through physical objects quite well. Due to the crystalline nature of the human body and it's ability to resonate with specific frequencies, we can benefit greatly by these pure tones. One reason the pure tones vibrate our body is that it has a natural affinity to quartz. The human body is composed of many crystalline substances, the bones, blood and DNA are crystalline in structure as well as the liquid crystal-colloidal structure of the brain. Even on a molecular level, our cells contain silica, which balances our electromagnetic energies, and this is the same substance found in quartz crystal. Quartz crystal bowls are basically made from sand. Sand can found all over the world and most of it is in the form of silicone dioxide or quartz. Only the purest sources of silica sand are used in the manufacture of crystal bowls. The sand is dropped into a centrifugal force spinning mold, and at the proper instant, in the center of that mold, there is an electric arc torch that is ignited to approximately 4000 degrees centigrade. It integrates the individual particles of sand into an amorphous unified whole, which goes from being crystalline in nature to being amorphous --or glass--in nature. The result is a synthesized form of absolute timbre, which is able to send out a tone, perceptible by the ear for almost 2000 feet. This process is known as quartz fusion. Crystal singing bowls come in two types, clear and frosted. Frosted bowls are made using the method mentioned above. 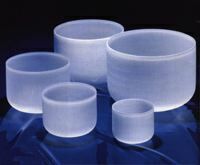 Clear bowls are made from cut sections of large diameter quartz tubing that is melted and fuzed together at one end. Bowls can be created to play to at certain frequencies. Clear bowls come is sizes that range in diameter from 6 inches - 12 inches. Prices on clear bowls vary from $200 - $400. Frosted bowls come is sizes that range in diameter from 8 inches - 24 inches and vary in price from $200. - $500. Each bowl is accompanied by a wooden stick that is covered with suede. They can rest on a rubber "O Ring" base. As you move the stick around the perimeter of the bowl it creates a harmonic tone that becomes stronger as you go around each time. The bowl quickly appears to be singing. You can work with more than one bowl at the same time. Crystal bowls have definite eye appeal. Clear bowls are lighter, more expensive and play best when held in the hand. The sound from the clear bowls is often interpreted as more intense and pure, and is preferred by some. The frosted bowls also emit a powerful, resonance. The larger bowls are much more reverberant, with the tone lingering longer, simply because of the size and amount of crystal. The size of the bowl does not necessarily determine its note. A particular size of bowl may be available in more than one note or tone. Pitch varies with weight, wall height, and wall thickness. One will have a sense of which tone "feels" most congruent with individual needs or desires. Some bowls may harmonize with others, and when played simultaneously, the effect is exquisite and synergistic. Sound healing is the practice of using sound to realize and correct imbalances in the body. Vibrations or frequencies are measured in cycles per second or simply "Hertz". All things will vibrate or resonate to certain frequencies. Sound as well as light are both vibrations. Sound healing works because, like all matter, the human body is not solid. Rather it is energy that is held together by sound. Any disease therefore, indicates that part of our system has moved out of balance and is consequently vibrating at an off frequency. Harmonious synchronization between the mental, emotional, physical and spiritual bodies results in health. Probably the most direct and effective healing force for restoring harmony is through the experience of powerful resonant sounds. Crystal Singing Bowls are ideal for use in the home or office to clear negative energy and bring in positive chi, as crystals are widely used in Feng Shui cures. The noted author Karen Kingston, in her book Creating Sacred Space with Feng Shui notes that crystals "symbolically bring more positive life force into your home. Crystals focus, activate and lift energy..." Since all of our crystal bowls are made with the purest quartz crystal available, they naturally contain the ability to energize, clear and enhance the energy in any environment. Crystal Singing bowls can be seen to encompass both Yin and Yang energies, and also contain several of the qualities of the Five Elements. The bowls are rounded in a pleasing way, and as bowls, they are receptacles for Yin energy, but when they are played, their sound and vibrations can bring forth the energetic Yang forces that help cleanse and purify any space. They are made of crystal, which is traditionally seen as Earth energy, but through their color, appearance and use can also invoke Water or Metal. They are truly multi-purpose tools for all occasions!! The large Frosted bowls contain great Earth energy and are excellent for maintaining the beautiful atmosphere of harmony in a room, and when rung frequently, tend to add a sense of stability and grounding to the chi in the home, without generating stagnant energy. The deep resonance fills every part of the space and is very purifying. The white color also draws in Metal energy that is energizing and invigorating. White also represents purity and new beginnings. For instance, you could place a large classic frosted crystal bowl in an area which needs some stability but also could use a regular source of energetic chi. If it is placed near a source of light, the bowl can bring a beautiful radiance to any room, and the effect will only be enhanced through regular toning! An added advantage of the crystal singing bowls, is that unlike ordinary containers or bowls which may be used for Feng Shui purposes, the crystal singing bowls are tuned to specific harmonic frequencies that can be used with intention to help enhance specific qualities. For instance, you could place a clear crystal bowl tuned to the F note for the Heart chakra in the Relationship area of your home to help open yourself to love and to create a feeling of tranquility in your relationship with a loved one. Then while toning the bowl, you could enhance the energy vibrations of that area by focusing your intention on your relationship. There are so many possible combinations and uses that it would be impossible to list them all! We recommend a Qualified Feng Shui Consultant or some good reference books to assist you in placing your crystal singing bowl in the most auspicious locations for you. 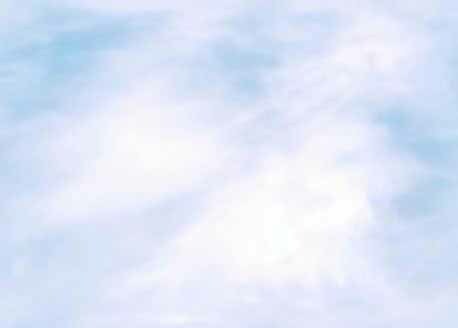 The human body may be seen as visible frequencies that produce an auric color field. Sound and color have a very fundamental relationship, and both are related to the health and harmony of the physical body. Sound is an acoustical wave as opposed to color which is an electromagnetic wave. Acoustical frequencies operate on the principle of compression and expansion of molecules and require a medium of a gas, liquid or solid for transmission. Electromagnetic frequencies are created by an oscillating electrical charge and can travel easily through empty space. However, even molecules of gasses, liquids and solids can't be compressed and expanded without creating an electrical charge and both acoustic and electromagnetic frequencies are measurable in what are known as Hertz (Hz) or vibrations per second. Let us look at the relationship between sound and color in the context of sound healing. Taking a look at the first octave for the note C, we see it has a frequency of 34.648 Hz (See diagram below). The same note C one octave higher, would have a frequency of 69.296Hz, exactly twice the frequency of this note in the first octave. The color which relates to the note C is red. The frequency of the color red is approximately 428,570 GHz.or 428,570 billion Hz. Although I haven't done the math on this one (I'll leave that up to rocket scientists), 428,570 billion should come close to being a multiple of 34.648. In other words, the frequency of red is a higher harmonic of the note C. Therefore, color and sound have a powerful relationship and can be used together to aid in bringing balance and harmony to all parts of the emotional and physical body. Located at the base of the spine. Contains the primary 8 cells that have all of the knowledge of creation and remain the only cells in your body that do not change in your lifetime. It grounds us in the physical world. Located just beneath the navel, and related to our sexual and reproductive capacity. Blockage manifests as emotional problems or sexual guilt. Seat of Emotions.? Gives us a sense of personal power in the world. Blockage manifests as anger or a sense of victimization. Blockage can manifest as immune system or heart problems, or a lack of compassion. Tied to creativity and communication. Feels pressure when you are not communicating your emotions properly. Pineal Gland: Is a physical eye with the capabilities of looking upward. 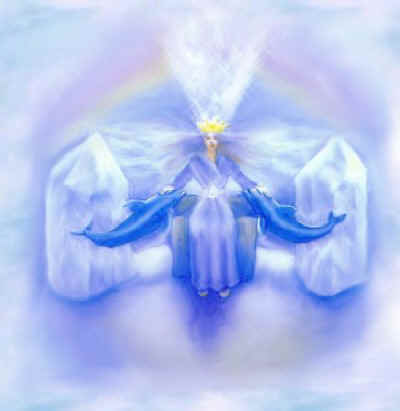 Connects you with message from higher realms. Can be experienced as a pressure on the top of the head. Crystal bowl music is a form of vibrational medicine which validates that everything in the universe is in a state of vibration and the frequency at which an object or person most naturally vibrates is called resonance. The chakras, bones, and organs in the body all possess a different resonant frequency. When an organ or part of the body is vibrating out of tune or non-harmoniously, it is called "dis-ease" or disease. A body is in a healthy state of being when each cell, each organ creates a resonance that is in harmony with the whole being. Vibrational medicine is based on the idea that all illness or disease is characterized by a blockage of the energy channels on some level. When there is a blockage, the organ in question stops vibrating at a healthy frequency and thus it results in some kind of illness. So through sound and light one can break up, dissolve and release these blockages that initiate in our etheric body. With proper intent, the pure tones that emanate from crystal bowls can be a powerful force in bringing conscious awareness and vibrational rebalancing to areas of our bodies that are "out of tune". When we lovingly and consciously attune our awareness to those places in our bodies that are wanting to be noticed, and use the power of sound to carry our loving intent, then we open the doorway for the emotional body to heal. When the emotional body is well so is the physical body! As we heal our selves we heal the world around us. Many cultures recognize the importance of music and sound as a healing power. In the ancient civilizations of India, the Orient, Africa, Europe and among the Aborigines and American Indians, the practice of using sound to heal and achieve balance from within has existed for thousands of years. The Tibetans still use bells, chimes, bowls, and chanting as the foundation of their spiritual practice. In Bali, Indonesia, the echoing gamelang, gong, and drum are used in ceremonies to uplift and send messages. The Australian Aborigines and Native American shamans use vocal toning and repetitive sound vibration with instruments created from nature in sacred ceremony to adjust any imbalance of the spirit, emotions or physical being. The Priests of ancient Egypt knew how to use vowel sounds to resonate their energy centers or chakras. There is a direct link between different parts of the body and specific sounds. Healing through sound goes back even further-at least as far back as Atlantis where the power of sound was combined with the power of the crystal. At the present time the Hopi American Indian prophecy is being fulfilled with the "Coming of the Rainbow People", through the keepers of the crystal bowls. This ancient wisdom has emerged to heal and uplift the consciousness of the universe through pure crystal tone. Prophet Edgar Cayce, predicted pure tones will be used for healing before the end of this century". Items at this on-line store are shown as curios. We make no claims nor guarantee any magical or supernatural powers for any item. The names and assumed powers are derived from books, folklore and various other sources. The information provided is for educational purposes only and is not intended as diagnosis, treatment, or prescription of any kind. The decision to use, or not to use, any information is the sole responsibility of the reader. This information is not intended to be a substitute for professional medical advice. You should not use this information to diagnose or treat a health problem or disease without consulting with a qualified healthcare provider. Please consult your healthcare provider with any questions or concerns you may have regarding your condition.